Once the signal has been passed through the Noise Reduction Filter and the Frequency Shaper, it will be passed through our Amplitude Shaper. The dynamic range of hearing is measured in terms of sound pressure, in decibels. A normal hearing range extends from approximately 0 dB to 120 dB, where 0 dB is the Threshold of Hearing and 120 dB is the Threshold of Pain. Discomfort usually begins to occur around a saturation level of about 90 dB of sound. Hearing loss compresses the range of hearing, raising the Threshold of Hearing and typically lowering the Threshold of Pain. For example, a person with moderate hearing loss would have a Threshold of Hearing around 40 - 70 dB and a Threshold of Pain around 100 dB. How does the Amplitude Shaper Work? We assume that the Frequency Shaper raises the frequencies that the user has difficulty hearing to sound pressure levels within his dynamic range of hearing. Therefore, all that our Amplitude Shaper has to do is check, bit by bit, that output power does not exceed a given saturation level, Psat. Since noise is concentrated in the low power levels as well, the filter also removes a significant amount of noise. 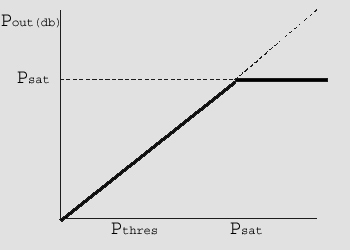 Output power is equal to zero for levels below Psat. To implement this, algorithm, we created an amplitude shaper in MATLAB.